Grains form the foundation on which beer is built. They lend flavor, aroma, color and mouthfeel to beer. They also provide the raw ingredients needed for the yeast to create alcohol. Quite simply, without grain, there is no beer. Many grains can be used to brew beer. Without looking too hard, you can find beers brewed with wheat, oat, corn, rice, or rye. But without question, the undisputed king of brewing grains is barley, specifically malted barley. Why is barley the brewing grain of choice? Well, as brewing Jedi Master Randy Mosher puts it, “Barley is the perfect brewing grain.” That’s because it naturally contains almost everything needed to make beer: high starch content, the enzymes needed to convert the starch to sugar, and proteins to aid in yeast health. Barley’s husks are even perfectly suited to act as a filter during the brewing process – which is crucial, as anyone who has ever had their brewing system gummed up with wheat or rye can tell you. Barley is so perfectly designed for making beer that anthropologists have suggested that the reason it was domesticated in the first place, roughly 10,000 years ago, was so that people could brew beer. While grains form the backbone of all beers, if left unchecked, they can cause a beer to become undrinkably sweet. That is why brewers add other ingredients, usually something bitter, to counterbalance the malt. In the distant past, a variety of herbs were used to pair with the malt in beer. But for the last thousand years or so, it’s pretty much been a one-plant show: hops. The bitter acids contained in the cone of the hop were perfectly suited to smoothing out the malty flavors in beer, making them easier to drink. As an added bonus, these same acids also acted as a natural antibacterial, slowing beer spoilage. This effect was greatly relied upon in the days before pasteurization, and it is one of the key reasons that hops became the primary bittering agent in beer. In addition to bittering the beer, the essential oils in hops lend beer a huge variety of flavors and aromas, ranging from earthy to herbaceous, or even tropical. And what’s really cool about hops is that the process for extracting their bitterness and the process for extracting their flavors and aromas are mutually exclusive. While the bittering alpha acids in hops are only released at boiling temperatures, these same temperatures will quickly dissipate the extremely volatile aroma and flavoring oils contained in the hop cone. Likewise, the cooler temperatures used to coax the aromatics out of hops are not nearly hot enough to dissolve (isomerize, technically) the bitter alpha acids. As a result, brewers have a huge amount of control over the hop character of their beer. If they prefer their beer to be malt driven, with just enough of a clean bitterness to balance out the brew, they will add the hops early on during the boil. Conversely, if a brewer wants to really highlight the aromatics of a beer without it being face-puckeringly bitter, they will add the hops just at the end of the brewing process. Usually it’s a combination of the two, with some hops added at the beginning and others at the end. Many people completely forget about water when listing the components of beer, even though it usually represents over 95% of the final product! More than a simple vehicle for holding the other ingredients, water lends many essential, if overlooked, characteristics to beer. The presence (or lack of) minerals in an areas water supply can have huge impacts on how a beer will taste. In fact, for most of beer’s history, certain styles were associated to a specific region for this reason. 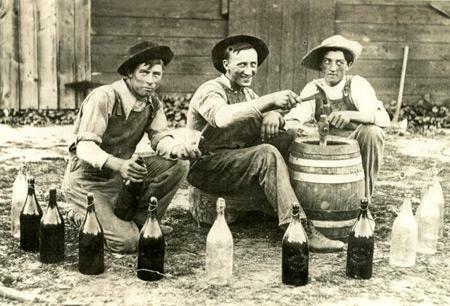 Long before anyone knew to measure the mineral content of well water, people realized that the English town of Burton on Trent made some of the best bitter beers on earth. Only later was it discovered that the unique qualities of Burton beer were due to the high sulfate levels of the water there, which accentuated the bitter flavors of their beer. In Munich, the water had hardly any sulfates but instead was rich in carbonate. As a result, any hoppy beer the local brewers tried to make (and they certainly did try!) would turn out harsh and unpalatable. But that same local water’s rich calcium content helped to promote the soft, full mouthfeel of more malt-prominent beers such as dunkel. On the opposite end of the spectrum, the Czech town of Plzen has water with almost no mineral content to speak of. This amazingly soft water allowed the bright, clean-tasting lagers of their namesake to dominate the world! Today, modern brewing technology has given brewers from anywhere in the world the ability to analyze their own water source and adjust it as needed. In fact, it is now common practice in larger breweries to strip out all mineral content totally, only to add them back in precise measurements. Nowadays adjusting water levels is an ordinary step for any brew day. If you asked a random person on the street to describe beer, the first two things they would likely say is “alcohol” and “carbonated”. What that person may not know is that both of those traits are entirely the responsibility of yeast. Once introduced into unfermented beer (wort), yeast will immediately begin to consume the sugars from the malt. Yeast convert this sugar to alcohol, with an added byproduct being carbonation. To put it more crudely, yeast eat sugar, pee alcohol and fart carbonation! Once the yeast have consumed all the available sugars in the beer, they will go dormant and slowly settle at the bottom of the tank, leaving clear beer above. This process is called “dropping bright, and is usually sped up by the brewer though the use of fining agents or mechanical filtering before packaging into bottles, cans, or kegs. This allows for a clear, bright final product. Some beers are intentionally left in contact with the yeast, either to add flavor or to allow the beer to continue to condition after bottling. If you even see the term “bottle conditioned” on a beer, that means there was active yeast left or added to the bottle. Bottle conditioned beers can often be cellared for long periods of time to gradually evolve in flavor. The first thing a brewer needs to do before getting to work making beer is to ensure that their brewing grain is ready to go. Assuming they aren’t malting their own barley, this means milling, or crushing, the grains. This crucially important step can make or break a beer before it has even begun. The key is to crush the grains enough so that it exposes the starchy center of the barley seed without damaging the grain hulls that encase them. If the crush is too course, not enough of the starch will be converted to fermentable sugars. If the crush is too fine, the husks, which act as a filter bed for the brew will be destroyed, and the brew will become gummy and unusable. 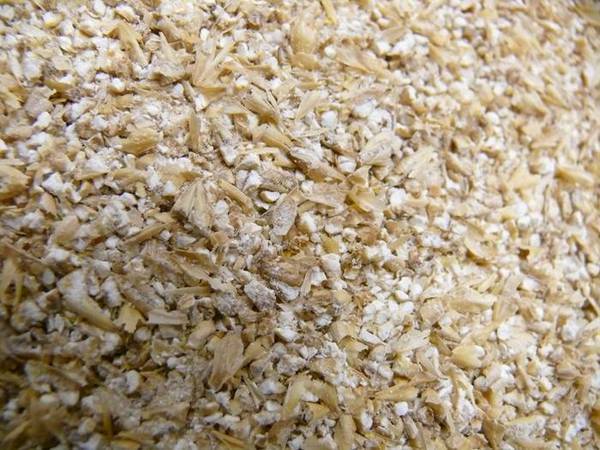 Below is a picture of well-milled barley. Note how the barley kernels have been cracked into large pieces while the hulls have remained largely intact. Once the grain has been milled, it is added to a large vessel called the mash tun, and mixed with hot water to form the mash. That’s when the magic starts to happen. The heat from the water (referred to as liquor in breweries) activates the enzymes within the barley. These enzymes then begin to convert the starches in the grains into sugars. Since there are several different types of enzymes within barley, each with a preferred temperature at which they like to work, brewers monitor the mash temperatures extremely close. By raising and lowering the temperature of the mash, brewers can control what types of sugars are produced by the enzymes. At lower temperatures, highly fermentable sugars are created, resulting in dry beers. At higher temperatures, the sugars aren’t as easily digested by the yeast, resulting in a beer with some sugars left unfermented, and thus a sweeter, more full-bodied end product. The enzymes work quickly too. Within about an hour they will be done converting starch to sugar, at which point the brewer will end the enzymatic activity by raising the temperature of the mash to over 200 degrees Fahrenheit, a process known as mashing out. The next step in the brewing process is the take the mash, and separate out the spent grain from the sugary liquid known as wort (pronounced wert). This process is called lautering. To begin the lautering process, the mash is transferred to vessel with a false-bottom called a lauter tun. Here the clear wort is drained away from the hulls and barley grist. Water is also added during lautering, in order to extract even more of the fermentable sugars from the grain. This is known as sparging. Sparging must be done very gradually as to not disrupt the grain bed that acts as a natural filter for the wort. Brewers typically add sparge water at the same rate as the wort is being drained below, although some English brewing methods call for completely draining the wort, then adding water and doing it all over again. This second go-round of lautering is called second runnings, and was historically made for small beers. Brewers must be careful not the sparge for too long, as eventually the bitter tannins from the grain will also be stripped away. Once the sweet wort has been separated from the grains, it is brought to a strong, prolonged boil for one to two hours. This boiling process is critical for many reasons. First, and from a historical point, most importantly, it sterilizes the beer. In today’s modern world, that seems fairly important, but for a long time this was quite literally a life-saver. For centuries people commingled their clean and run-off water supplies, leading their drinking water to become a town-well-sized petri dish for harmful bacteria. Of course, people didn’t understand this. They just knew the water was unsafe, and that something in the brewing process made water ok to drink. It’s for this reason that everyone drank beer, including small children. Boiling does more than sterilize the brew, however. Hops introduced to boiling water will begin to break down, or isomerize, molecularly altering the composition of the acids within the hops and releasing bitterness into the beer. The longer the hops are boiled, the more of their alpha acids will be isomerized in order to lend bitterness to the brew. Hops added to the boil to lend bitterness are called early hop additions, and are generally allowed to boil in the beer for an hour or more. Hops added later in the boil don’t bitter the beer all that much, but instead lend flavor and aroma. This is because in addition to alpha acids, hops also contain highly volatile, and very pungent oils, which break down quickly in boiling water. However if only exposed to the boiling wort for a short period of time, or at lower temperatures, hops will release these oils and lend aromatics and flavor to the beer. To extract flavor, brewers typically add hops about 10-15 minutes before the end of the boil. For aroma, hops are added even later, no more than 2 minutes before the end of the boil. Often aromatic hop additions even occur just after the boil ends. Once the boil is completed it is sent to a whirlpool to collect any hop matter and coagulated proteins that have accumulated. Then it is immediately cooled. Cooling the beer quickly is important, since the beer will begin to oxidize and produce off flavors almost immediately at these temperatures. Once the wort has been cooled, it is moved to a fermentor, which is usually just a large stainless steel vat (or on rare occasions, oak). Next yeast is added and the fun begins! From the moment the yeast is added it gets to work eating the sugars that were created during the mash. As they consume the sugar, the yeast expels carbon dioxide and alcohol, as well as a variety of flavor compounds that vary greatly depending on several variables such as the specific strain of yeast, and fermentation temperature of the beer. Fermentation time can vary greatly, from a few days for a simple ale, to over a month for lagers. Fermentation is also where the brewer decides whether or not he/she will be brewing an ale or a lager. This decision is a simple choice of using lager yeast or ale yeast, although the brewing of the beer changes drastically depending on which direction the brewer goes. If brewing an ale, which account for the majority of beers by style, the brewer will pitch ale yeast and let the temperature of the fermenting beer rise to a toasty 65-76 degrees – perfect for ale yeast. 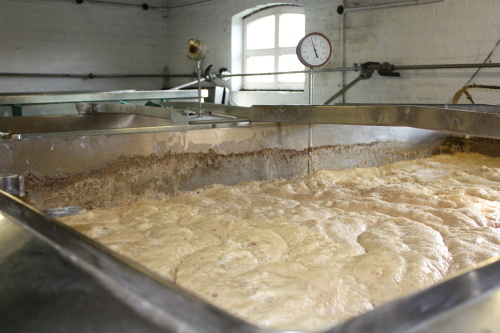 Also called top-fermenting yeast, ale yeast forms a thick layer pillowy foam at the top of the fermentation vessel. This is called a kräusen or pellicle, and if you didn’t know any better, you’d think it would kill you if you drank what was underneath it. But rest assured, there are no byproducts of beer, wanted or unwanted, that will hurt you (besides alcohol of course). This is a main reason why home brewing is legal. The worst you can do is make gross tasting beer! If brewing a lager, the brewer must keep the beer much cooler, usually between 45 and 55 degrees. At these temperatures, the lager yeasts work slowly and efficiently towards producing a clean tasting beer with little flavors given from the yeast itself. Unlike ales, lagers yeast, or bottom fermenting yeast, do not form a pellicle at the top of the fermentation vessel. Once the yeast has consumed all the available sugars, primary fermentation is over. While the beer is technically no longer fermenting, the yeast’s work is far from over. During the course of fermentation, several off flavors are created in addition to the production of alcohol and carbon dioxide. Common off flavors associated with under-conditioned or “green” beer is sulfur, butter, and green apples. Luckily, given enough time the yeast will absorb these off flavors. For ales, this conditioning can take a week or so. For lagers, whose yeast generally work more slowly, this can take months. To help speed up this process, some lager brewers employ the practice of kräusening, which is adding still fermenting wort (and the yeast inside it) to conditioning beer to help kick start the conditioning process. Once fermentation is over, and the yeast have worked their way through the off-flavors, it becomes dormant and begins to settle to the bottom of the fermentation vessel. From here, the brewer can easily remove the yeast, leaving only bright, clear beer. To help this process along, many brewers also filter the beer mechanically, or by adding filtering agents which help collect the yeast into larger groups, which then fall out of suspension at a faster rate. It’s easy to forget that the final step in the brewing process is packaging the beer. Luckily, brewers don’t forget this, or else we’d all be drinking directly from massive conditioning tanks (which now that I write it, sounds pretty awesome). In any regards, packaging is the process of putting the finished beer into vessels for mass consumption. Typically, beer is packing into bottles, cans, and kegs. Most brewers also force carbonate their beer just prior to packing, since they’ve allowed any CO2 developed during fermentation to escape into the atmosphere. Without allowing the CO2 to escape, the tanks could potentially rupture from the pressure build-up. Some brewers practice bottle conditioning, meaning that instead of force carbonating, yeast and sugar are added to the beer after it has been packaged, to bring on a second fermentation inside the bottle, thereby adding depth of flavor, as well as carbonation. Bottle conditioning can also enhance the shelf life of beer, as the yeast will consume any oxygen that seeps into bottled beer. Much has changed in modern bottling lines. Hats and overalls are now optional. Don’t be surprised if you see anybody wearing Kilts at Norsemen Brewing Co! Thanks to the folks at The Beer Temple for providing most this information.